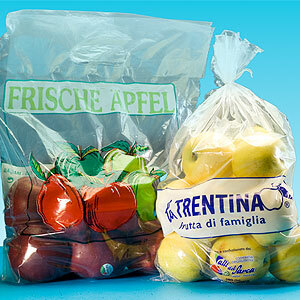 Packaging generally used for apples. The packaging machine must be automatically feeded by an electronic weighing machine or a fruit counting machine. The electronic weighing machine sets amount and weight of product for every bag, the vertical packaging system fills the bag, prints and applies the label. Under the packaging machine, a conveyor carries the bags to the palletizing system.